Xiaomi Redmi Go has been officially launched in India at an event in New Delhi today. It’s an interesting smartphone from the house of Xiaomi as the phone runs Android Go software and it’s priced at Rs 4,499. The first sale of the Redmi Go will take place on March 22 on Flipkart, Mi.com and Mi Home stores; Of course, it’ll be a flash sale. For the asking price, the Redmi Go offers specifications which we haven’t seen on any handset till date in the price range. The phone is powered by the Qualcomm Snapdragon 425 SoC and is backed by a 3000mAh battery which coupled with the lightweight software should deliver decent battery life. And the best part is Xiaomi did not modify the software to MIUI and it runs a clean version of Android Go Edition, but the camera app is the one which we saw on MIUI. The Redmi Go rocks a 5-inch HD display and it’s the first Android Go phone to come out with an HD screen. Under the hood, it has the Qualcomm Snapdragon 425 chipset, paired with 1GB of RAM and 16GB of internal storage. The phone also has a dedicated microSD card slot for storage expansion. We have seen the Snapdragon 425 chipset in other Xiaomi phones such as the Redmi 4A and Redmi 5A, and it’s a decent chip for carrying out day-to-day tasks. As noted, the Redmi Go runs a clean version of Android Oreo (Go Edition) with an update to Android 9 Pie (Go Edition) coming at a later date. As for the cameras, we’re looking at an 8MP shooter on the rear side with LED flash and a 5MP shooter on the front for selfies and video calls. Connectivity options on the handset include 4G LTE, VoLTE, Wi-Fi 802.11 b/g/n, Bluetooth 4.2, GPS and a Micro USB port. Being an Android Go phone, the Redmi Go comes preinstalled with all the Lite apps from Google such as Google Go, Gmail Go, among others. Lastly, the phone is backed by a 3000mAh battery. And yes, the Redmi Go lacks Dual 4G feature, so you’ll be restricted to 4G on the primary SIM card and 3G/2G on the second. 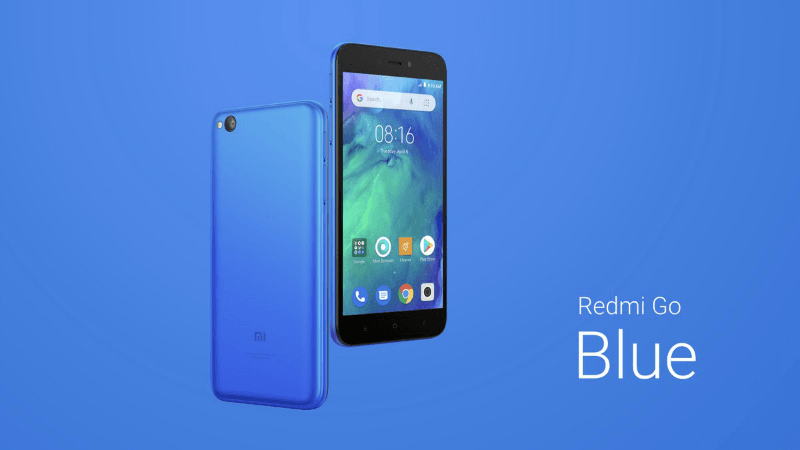 Xiaomi has launched the Redmi Go in two colour variants in India- Blue and Black. The phone comes in a single variant with 1GB of RAM and 8GB of onboard storage, and it’s priced at Rs 4,499. Everyone expected the pricing of the Redmi Go to be Rs 4,999, but Xiaomi’s Honest Pricing philosophy comes into the picture here. The first sale of the smartphone will take place on Flipkart, Mi.com on March 22. Why Redmi Go is Important for Xiaomi? Xiaomi has been entry-level smartphones since its entry to the Indian market. Every year, it debuts an entry-level smartphone at Rs 5,999 which sells in millions and also serves as a go-to option for the first-time smartphone buyers. But with the Redmi Go, Xiaomi is changing things slightly. In India, feature phones still account for the majority of market share, and in recent times, smart feature phones like the Reliance JioPhone 2 are the talk of the town. Priced at Rs 2,999, the JioPhone 2 goes out of stock every time it appears for sale on Jio.com. So if a user is ready to purchase a feature phone at Rs 2,999, why not spend Rs 1,500 more and get a basic Android phone that offers functionalities way more than a smart feature phone. Going by the pricing, we can judge that the Redmi Go will be another winner for Xiaomi in India and it will only sell in massive volumes. Bhai 2000 me to iPhone 4 mil raha hey Kuwait me. iPhone SE 6000 mey. N wats the price of iPhone 7? Ok I’ll let you know after few days. Actually one of my relatives working in Kuwait. He came to India few days back. Are you liking Redmi Note 6 Pro/Asus Zenfone Max Pro M2? @Nikhil postponed my purchase for few days. Will order Note 7 pro next month. Lil short on cash. And I think 4k extra worth for SD 675 and sony imx 586 camera.